Why Buy Just a Video Security System? When video systems were first available and affordable, organizations bought them to protect life and property – they acted as a deterrent. But it didn’t take long for criminals to realize all they had to do to thwart the cameras was to protect their identity. At that point, if there was an incident, all the reviewer could determine was what time the incident occurred, by how many people and how it was done. Not very helpful in deterring the crime or capturing those responsible. Unfortunately, this trend continues today. Organizations spend a good deal of money on high definition IP network cameras, but don’t get the benefits of the system being a deterrent or in capturing the perpetrators. 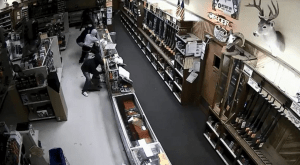 One recent example is a gun store burglary in Houston. It made national news back on March 1st of 2016 mostly because of the great video that was captured. In the early morning hours, a pickup truck pulled into the parking lot of one of Carter’s Country Guns & Ammo stores. The truck was backed up to the front door as one of the perpetrators smashed the glass door. 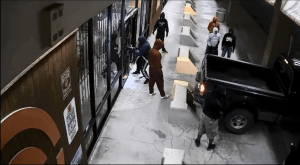 He and other accomplices secured the ends of a heavy chain around the tow hitch of the truck and the metal gates inside the store as their other accomplices watched. 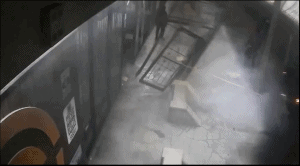 The driver of the truck then gunned it, ripping the gates and door from the storefront. The thieves were then free to loot the store stealing 85 guns. The owner must have spent a good deal of money on the security system because the images were crystal clear. My non-technical guess is the cameras were in the 3 to 5-megapixel range. But here’s the million-dollar question… What did the system do for the owner? 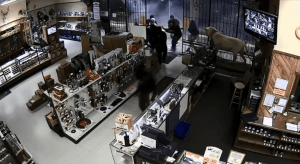 The store probably had a burglar alarm. When the glass was smashed, or more likely, when the door was ripped from its hinges, the burglar alarm went off. The central station receiving the signal would have then called the store to verify the alarm. When no one answered the phone, the central station presumably followed protocol and called the Houston Police. The Houston Police dispatcher likely would have coded the call as a Priority 3 or Priority 4, the latter being a non-emergency property crime. The average response in Houston for Priority 3 or 4 calls is about 20 minutes. These criminals were in and out of the site in under 5 minutes. What was the value of the system then other than using the information attained for an insurance report? The gun store owner could have used an analytic system instead. Though systems, capabilities, methodologies and accuracies differ by vendor, analytics for the most part use computer software programs to look through the camera lenses and classify every moving object in the scene. CheckVideo uses its patented algorithms – mathematical calculations to observe and track objects – to understand what those objects are by their shape and behavior. They then classify every moving object, recording them as persons or vehicles or animals or weather events such as rain or snow, for example. The administrator can set up the system to report to a central station and/or individuals should a person or vehicle come into view during a certain time of day or when the burglar alarm is armed. It can send a text, still image, video clip or hyperlink to the video so the information can be reviewed to determine friend vs. foe and react accordingly. In the case of the Houston gun store robbery, after watching video of the burglary online, I calculated the perpetrators were in the store or directly in front of the store for just over 3 minutes. They were likely in the parking lot for at least 30 seconds to a minute before they drove up to the front of the store to check the area (I would have recommended placing an exterior camera aimed at the parking lot in addition to the front entrance). Though the criminals were there for less than 10 minutes, CheckVideo analytics would have “seen” the truck coming into the parking lot at 4:30am which would have been a red flag for the responding operator. Shortly thereafter, the analytics would have continued to send in video alerts and the operator would have had enough information to dispatch police. The 911 operator would have coded the call as a Priority 2. Though Houston Police response time for a Priority 2 call is 10 minutes, they would have had descriptions of the vehicles and the police would have likely dispatched more units because of what the operator was viewing and conveying to dispatch. It is arguable that the police would have intercepted the criminals. The difference of a verified response vs. a low priority burglar alarm response could have made the difference in the outcome. 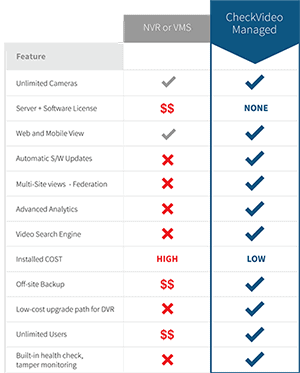 For about the same cost, why would any business owner settle for just a video security system? Why should they?